Update 2013: the number of axe murders said to take place in this bar seems to go up every Halloween. Only one can actually be verified, though. If you watched Ghost Lab tonight, you caught them talking about the two axe murders and one pop bottle bludgeoning that took place in The Liar’s Club, a frequent tour stop for us. An interesting thing in this episode was the woman talking about people picking up on residual emotions left over from violent deaths. I have actually seen this in action at the club – in the upstairs room, where the murders took place, I once had a tour patron become very disturbed – she felt almost as though she was being “possessed” by something very unpleasant, and had to leave the room. I can’t say what was really going on in her head, but I HAVE gotten good at telling when someone is putting me on, and she wasn’t doing that. However, that has only happened once, and is, in fact, the ONLY ghosty experience I’ve ever had at the location. But it did happen RIGHT in the spot the Ghost Lab team was testing. As usual, the issue I have with these guys is that they seem to believe everything they hear, and seem awfully quick to claim that any weird picture or equipment reading they come up with is definitely a ghost. Perhaps it’s just the way the show is edited. I’m glad they at least came clean on the banging noise that turned out to be a manhole being driven over tonight, and I’m glad to see them using gear that I DON’T have – I’ve never had the chance to use a biocam. I’m also not entirely sure why they put up obviously photoshopped headlines instead of the real newspaper clippings – probably just a rights issue. In any case, for your perusal, here are a couple of actual articles about the murders in the Liar’s Club: the pop bottle bludgeoning in 1962 and the axe murder from 1986. 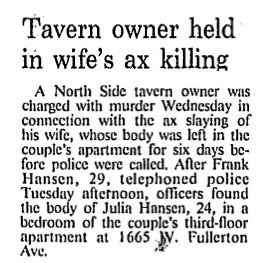 I don’t have any documents on the 1950s ax murder (bizarrely, it didn’t make the Tribune, if in fact it happened at all) – HOWEVER, there are more stories about the history of the place. 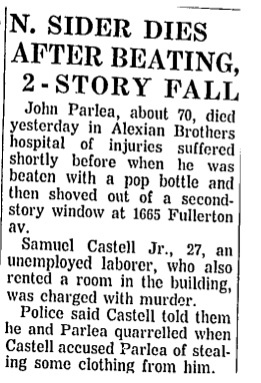 A guy who lived in the building was shot – and nearly killed – in a fight outside of a nearby bar in 1955, and there was actually very nearly ANOTHER murder in the upstairs room in just the last year, when a guy narrowly survived after having his throat cut in a bar fight. The article notes that the body from the 1986 murder was found on the third floor, not the second, which is always said to be where all of the murders took place. It is also probably worth noting that the pop bottle guy appears to have died in the hospital, not outside of the club, though I believe other sources say he was dead on arrival. It looks like next week’s episode will be the investigation at a place I’ve investigated heavily – Old Town Tatu. Weird Chicago is all over the media this month – Ken will be on Last Call with Carson Daley soon, and this Saturday I’ll be chatting for a couple of hours with The Paranormal View! The Chicago Tribune has the story. I’ll be interested to see if this thing turns up! This week marks the 30th anniversary of the infamous Disco Demolition Day at Comiskey Park, at which admission to the double-header game cost 98 cents and a disco record to be demolished between the games by a local DJ – it’s somewhat odd to stop and think that the days of local radio personalities pulling these sort of stunts (and getting any notice for it) are basically over. Disco Demoilition Day was a disaster – many fans ended up using the records as frisbees, leading at least one player to wear his batting helmet into the outfield, and after the records were blown up, fans stormed the field and trashed the place. The Chicago Reader has a fascinating story on the day, followed by some very interesting debate in the comments about whether there were racial/political motivations lurking in the rioters’ brains. I always thought rockers hated disco on general principle, not because they identified it as urban/latino/gay culture myself, but, hey, what do I know? The Sun Times reports today that one of the finds at Burr Oak Cemetery was the original (empty since a 2005 exhumation) casket of Emmit Till, an accidental martyr of the civil rights movement, rotting away in a shed, surrounded by garbage and inhabited by a family of possums. It should be noted that Till’s was NOT one of the bodies dug up and dumped; he was exhumed a few years ago and reburied in a different coffin. The original iconic glass coffin was to be a part of a memorial; money raised for it was apparently pocketed by one of the people who has been arrested for dumping the bodies around. Till’s glass coffin was a priceless icon of the civil rights movement – one of the most horrifying things about the injustices committed against black Americans just because they were black throughout the first half of the 20th century was that no one really seemed to give a damn – but after Emmit Till, they could no longer look away. Till was a 14 year old Chicagoan who was visiting Mississippi in 1955. After allegedly whistling at a white woman, a couple of guys kidnapped, beat, tortured, and murdered him. Two men were quickly acquitted by an all-white jury who barely deliberated at all – and, knowing they could never be retried, cheerfully admitted the next year that they had been the killers. Till’s mother insisted on showing the world what had happened to her son – the casket had a glass top, and a photo of his mutilated face was shown around the world. People could no longer look away. Well, they COULD, but they could no longer pretend that things weren’t really all that bad, or that the civil rights movement was just a bunch of angry poor people letting off steam (or, again, they COULD, but they’d look like – and still look like – massive jerks). I was a bit dismissive of the crime yesterday – yes, it HAS happened before – but as the story progresses, and the number of desecrated graves rises to the 300s, I’m getting progressively angrier. Yep – graves have been dug up at Burr Oak Cemetery in the suburb of Alsip and stashed in a pit. Usually when graves are dug up, it’s a case of vandals (like, say, Bachelor’s Grove, where cops caught kids digging up bodies for kicks at least a couple of times in the 1960s and 70s), but in this case, it’s a matter of the cemetery employees digging up bodies so the plots could be re-sold. The cemetery in question is about 20 blocks due north of Bachelor’s Grove. Comments below the Trib story seem to be one person after another saying “what has the world come to? this is a new low!” or some variation on that, but there’s nothing new about this at all – double-selling grave plots is one of the oldest tricks in the book. In fact, at City Cemetery (Lincoln Park since the late 1860s), families would often break ground on a plot and find someone already there – no one can say if this was a case of bad record-keeping or of unscrupulous double-selling by people who couldn’t be bothered to move the original body, but it was probably a combination of both. One person suggested that this might lead to the mayor deciding to force cemeteries to sell graves for 75 years, instead of permanantly, so the city could resell them – nevermind that selling term graves was a pretty standard practice back in the day. Just about every girl ever suspected of being Resurrection Mary was buried in a term grave. For the record, no – we will not be going to the cemetery on our tours. It’s out in the burbs, far from the tour route, and getting a bus into a cemetery at night is shaky legal ground. The most any tour company could do is drive past it, and it getting there and back would take just about the entire tour.